Preheat oven to 325 degrees. Remove turkey neck and giblets. Pat turkey dry, inside and out and season inside liberally with kosher salt and freshly ground pepper. Place on roasting rack in a large roasting pan. Fill turkey cavity with onions, whole garlic cut in half, lemons, oranges and a 2-3 stems of each herb. Combine 4 tablespoons of softened butter with 1 teaspoon of kosher salt, 1/2 teaspoon of freshly ground black pepper, 2 cloves of garlic that have been minced into paste, 1 tablespoon of minced sage, 1 tablespoon chopped parsley, 1 teaspoon minced rosemary and 1 teaspoon of minced thyme leaves. Gently loosen skin from turkey breast and turkey legs and spread garlic herb butter under the skin. Tuck wing tips under and use extra skin at base of backbone to tuck turkey legs together. You can also use cooking twine for this step, if preferred. Spread remaining softened butter all over outside of turkey and season liberally with kosher salt and freshly ground black pepper. 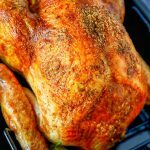 Roasted at 325 degrees for two hours, then increase temperature to 425 degrees and roast for another 30 minutes to one hour depending on size of turkey. Begin checking turkey for doneness at the 2 hour mark. Turkey is done when breast meat registers 165 degrees and thigh meat is 170-175 degrees. IMPORTANT - Let turkey rest 45 minutes to one hour before carving.